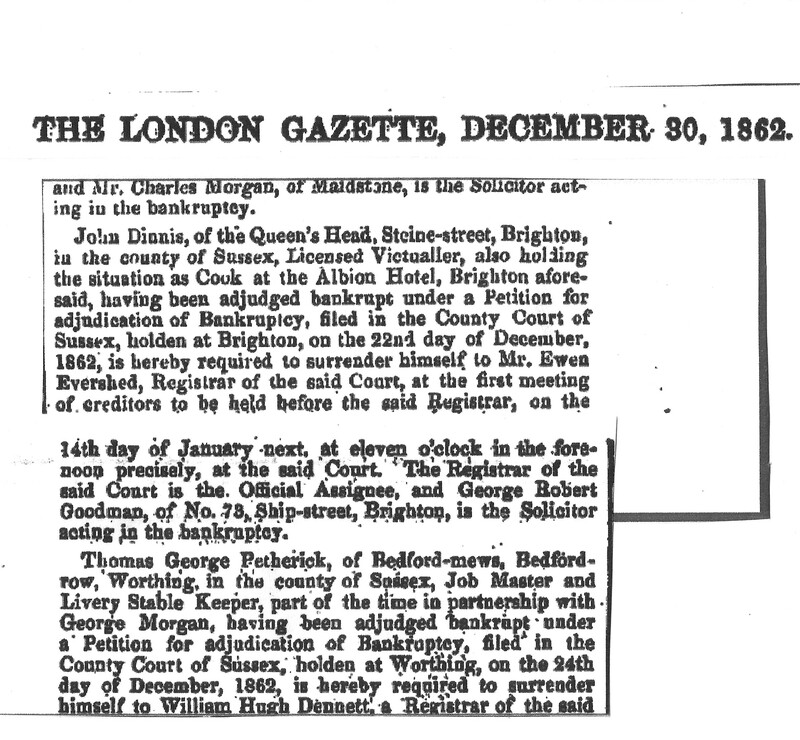 John Dinnis (my gg grandfather) appeared in The London Gazette in 1862. This information, which I found yesterday gives me a better insight into the family and why they may have moved from Brighton to London in the late 1860s. I still have a lot of digging to do, but for now here is the excerpt from the London Gazette along with an old image of John Dinnis. 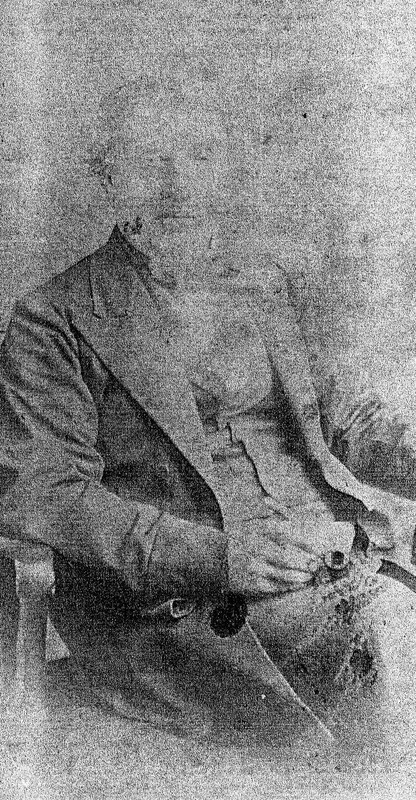 John Dinnis, of the Queen’s Head, Steine-street, Brighton, in the county of Sussex, Licensed Victualler, also holding the situation as Cook at the Albion Hotel, Brighton aforesaid, having been adjudged bankrupt under a Petition for adjudication of Bankruptcy, filed in the County Court of Sussex, holden at Brighton, on the 22nd day of December, 1862, is hereby required to surrender himself to Mr. Ewen Evershed, Registrar of the said Court, at the first meeting of creditors to be held before the said Registrar, on the 14th day of January-next, at eleven o’clock in the fore*noon precisely, at the said “Court c The Registrar of the said Court is the. Official Assignee, and George Robert Goodman, of No. 73, .Ship-street, Brighton, is the Solicitor acting in the bankruptcy. This information was also recorded in the Edinburgh Gazette on 2 January 1863. Having found the entry in the London Gazette I was keen to make sure it was ‘my’ John Dinnis they were writing about. It mentions that he was ‘of the Queens Head, Steine Street, Brighton’ and I know John Dinnis was there at that time because of the 1861 England Census. He was the Cook and Publican. What I didn’t know, and was surprised to read was that John Dinnis was also ‘holding the situation as Cook at the Albion Hotel, Brighton’. This hotel, now known as the Royal Albion Hotel is still here in Brighton, just around the corner from Steine Street and very close to The Old Ship Hotel, where we know John lived and worked as Cook and Publican from around 1851 to at least July 1856. I feel very sad that John and his family went through the harrowing experience of bankruptcy and will try to find more about what that actually meant for them at that time. On a more positive note I am delighted to know my ancestors were so much a part of Brighton’s history and it’s beach holiday heritage. I always wondered just why I feel so embedded in Brighton’s culture, and now I know. This entry was posted in DINNIS, John Dinnis and tagged Albion Hotel, Bankrupt, Brighton, London Gazette, Queens Head, Royal Albion Hotel, Steine Street. Bookmark the permalink. That is some great news. Glad your getting closer to your Roots! That’s sad to think they went through all that. I can’t wait until we meet again and you can update me with all you’ve found out.